Also, during this time above it was taken back when Summer was still here. 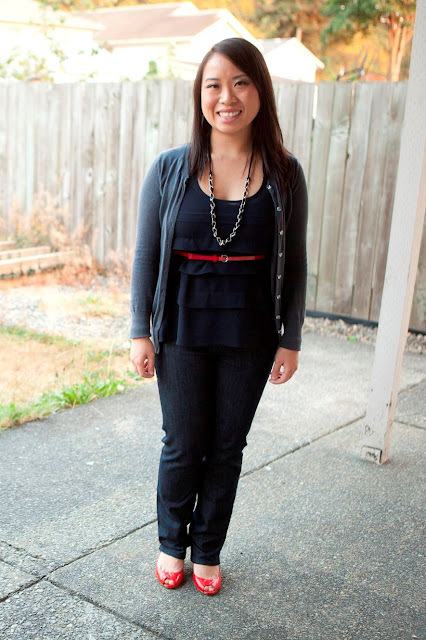 So I changed up this outfit to cater for Fall by adding a dark grey cardigan and dark-wash jeans to let the red accessories give more pops of color. Also, these red shoes are returning from a previous post. ;) And the necklace is my favorite part because it looks similar to the chain straps from my Chanel flappie. hehe.. I had to point that part out! What would be your pops of color for the Fall season? You can also follow me here for more pics! happy first day of october to u too! love the simplistic red touches! very chic! So glad I came across your page <3 Keep them coming. Pops of red are the best! Love it and you - you look lovely as always! 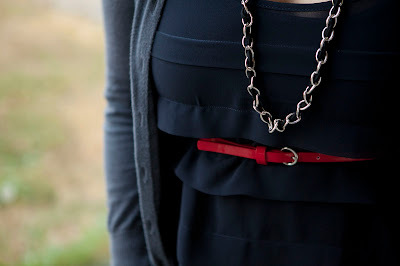 Lovely pops of red, I must say, and that chain necklace is so fab! I love your pops of red on your blue outfit!! 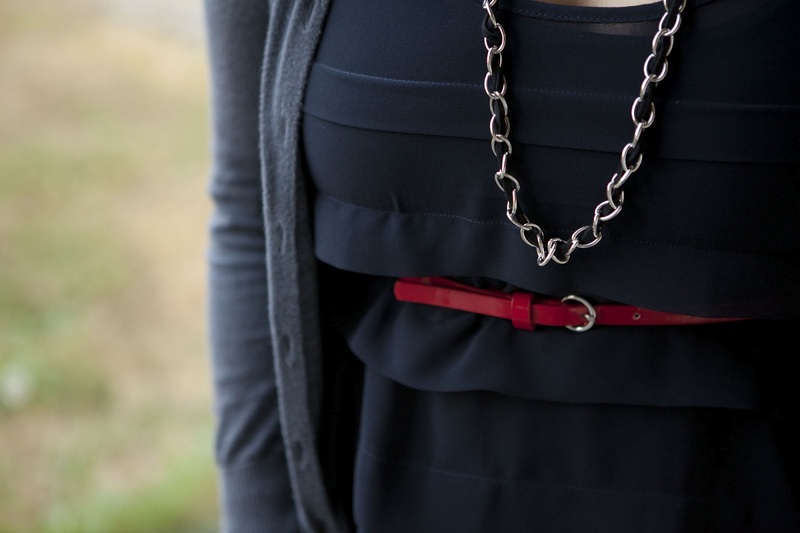 instant cute solution: red belt. perfectly styled! Hi! I found you through the BlogLoveTherapy blog hop. Now following you on GFC. I love the outfit. So sweet. The little red belt is a great touch! Shelia, you're so funny! I LOVE wearing red and black together. This is a great outfit. Happy Monday! 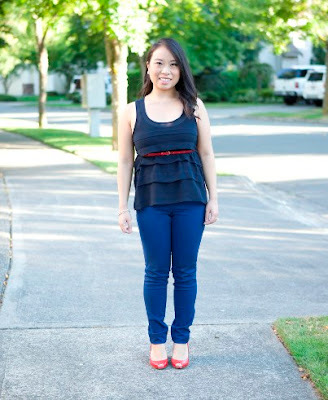 I'm glad these photos made it onto your blog because you look great! The red belt is positioned well too! Love the pops of red in an otherwise neutral look! Sheila you look adorable. The red accent really pop ! This is such a super cute outfit. I LOVE the pops of red, just the perfect amount too! Thanks for your comment on my blog. Cheers! Love the combination of fashion and food you have! I just might have to make some time and try one of your recipes - they look delicious! Love the little red pops of color here! I love the red details. Great outfit! Taking good pictures is hard. It's not easy capturing the essence of every outfit. Lovely pops of red. Your third attempt turned out well. Loving your pops of red, which is my favorite color. Thank you for stopping by my blog and for your kind comment. I am now a follower of your blog. Can't wait to see what you come up with next! I tend to go a bit monochrome, but I'm trying to learn to wear colour! My new Nike wedges have neon purple laces. I've thought about changing them to black, but kind of dared myself not to. Love the red belt and shoes. Shiny! You look so cute! I really like the little pops of red! You are absolutely adorable! And the pops of color are just perfect! I love the necklace and yes it def has the chanel chain look. Love the red, I think for colour this season it'll my pop of colour choice as well. The belt looks great in that position! Love the red! u look great! i personally love pops of red! cute outfit, I love the blue. I cannot wait to read more of your posts!! i love the red accessories! casual chic! love the touches of red! Thanks for visiting my blog and commenting back, wanna maybe follow each other? Lovely outfit! Love the pop of color! Thanks for your comment <3 Love this outfit, especially the necklace! You look fantastic! I really DO love the pops of red, so classic chic! Pops of red are always the best! Love the outfit! You are stunning and the pictures are very pretty ! Check out my PFW post if you want ! I love your style.The red pops add a sparkle to the outfit. I love the red accessories, very nice! You look so cute! I love the red accents in your outfit! Love that you retook the photos :) sometimes I see my photos and think dang I don't like something. Love the pops of red, my fav color. Sure we can follow each other. As you can see I`m following you and wait for following back! your top is so flirty and pretty! i like your blog hun. you look fab. Lovely outfit! Thanks for visiting my blog! love the pops of red! xO! Adorable look. Love the beautiful dress! !